Hi there! I’m glad you found your way to my blog. My name is Cathy LaReau and I am a Realtor for Area North Realty, Inc. in Hayward Wisconsin. Our office proudly serves the Hayward-area community in northwest Wisconsin, including Sawyer, Washburn, Douglas and Bayfield counties. I was born and raised in the Madison area and have been involved in Real Estate and Property Management all of my adult life. I have four children, Sarah who is in Virginia, and Tony, Kelly and Jody; all still in the southern Wisconsin area. 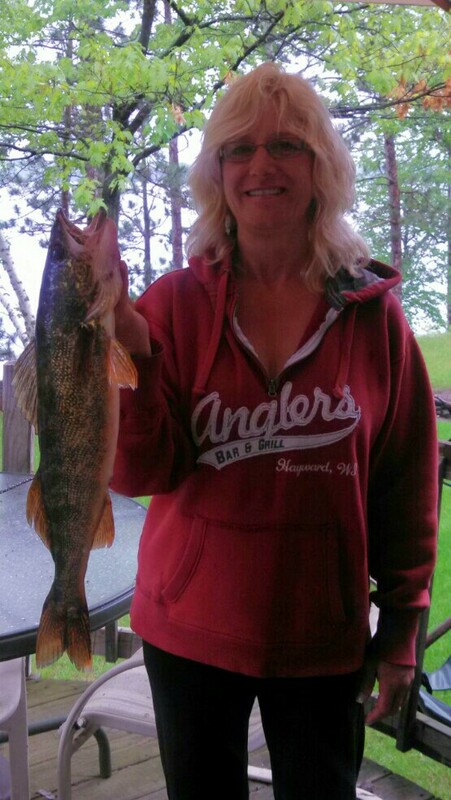 For several years we had a three-season cabin on Lac Courte Oreilles, a premier fishing lake of over 5000 acres and over 90 feet deep, just southwest of Hayward. For the first few years up here, I fished this lake almost every day – did we catch some nice fish! Although I enjoyed fishing for the walleyes, the large crappies we caught were my very favorite to eat. During winter of 2015 we moved into a nice four-season home on the Chippewa Flowage. And although we boated and fished here several times, this large lake will be a huge learning experience for me, and I can’t wait! I also enjoy snowshoeing and just being outdoors, especially in the woods or on the lake! Ever since I was a kid, the woods has been one of my favorite places to be- the smell of the pine trees, the sun poking through the summer canopy of the forest, exploring new trails. During fall, I spend most of my available evenings perched in my deer stand, observing all the woodland creatures, while waiting for a good buck to come along. I also make time to explore the Hayward area and meet new people, and I like to write about my experiences trying out new (and favorite) restaurants, resorts and visiting scenic areas. Working in real estate in the Hayward area is a particularly enriching lifestyle; I can enjoy everything ‘up north’ while I am working! I feel a deep satisfaction helping others realize their own dreams; finding that perfect quaint cabin in the woods or lakeside, or even selling their home so they can forge ahead on their journey elsewhere. I take great pride in providing excellent service to my clients throughout the entire process-whether buying or selling. Our Area North Realty office is comprised of professional, experienced, yet down-to-earth agents and a wonderfully-capable office manager; I have a wealth of information to tap into should I need it! Plus, our office is a member of the Northwest Wisconsin MLS and the Twin Cities MLS, so you can be assured I have the tools I need to help you. I had intended to make my personal website by now, but my work has kept me just too busy to put in the time needed for a comprehensive real estate website right now. I still hope to have it up and going sometime during winter of 2015-16. Visit my real estate website for all of your real estate needs in the Hayward area! Contact me if there is anything I can do for you. Come for a visit, I’ll show you around- you’ll quickly discover what is so enchanting about the Hayward area!